The Hoggs of Fife Aussie-style hat is a fully waterproof hat made from 100% cotton cuprawax. 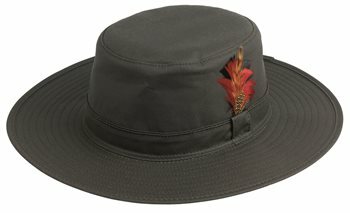 This is a quality wide brimmed hat with a stylish feather detail in the band. Looks fantastic with a wax jacket or country sports coat.